On May 26, 2016, 4:26 p.m.
Last weekend we were very pleased to give a drop-in CodeBug workshop at HOME’s first birthday in Manchester. Lots of people got to programme a CodeBug to take away, many of which were programming for the first time! 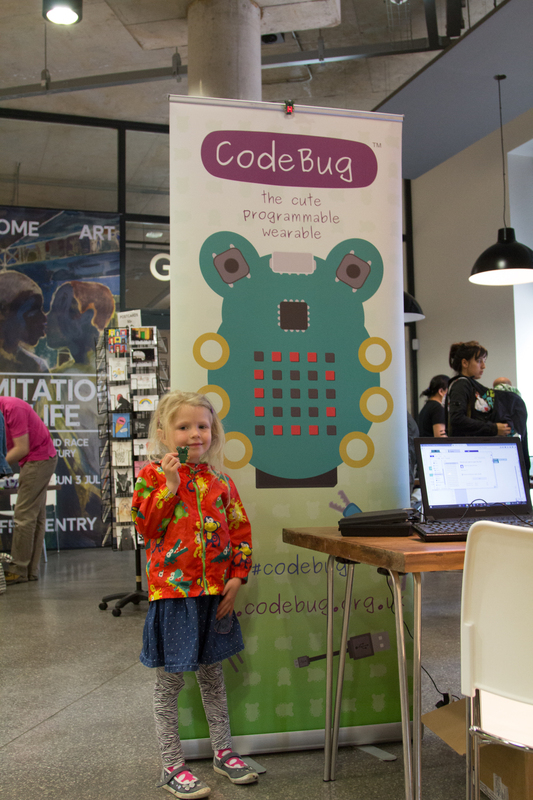 Children as young as 5 were scrolling their names on CodeBug in minutes. It was amazing to see the moment when a youngster realises the awesome thing they have done and then grabs for the mouse to make it even better! We were not alone in our enthusiasm for digital creatively at the birthday, our friends from CoderDojo and CodeClub were demoing other fun and shiney devices to get kids into coding. It was great to see our new technology wizards take to Twitter to show the world their creations. And because CodeBugs can be reprogrammed at home with just a web browser, the fun could continue after the workshop. It is so exciting to think that some of the young people having fun playing with CodeBug today will go on to create the technology of the future. HOME, the centre for arts and theatre in Manchester, opened a year ago and has since seen thousands of people pass through its doors. HOME has embraced the merging of arts and technology and were super excited to be part of it. For us, it's incredibly important to show everyone that coding isn’t scary and serious, that it is fun and creative! Sept. 5, 2016, 9:45 a.m.
Aug. 26, 2016, 8:24 a.m.
Aug. 18, 2016, 8:20 a.m.
July 28, 2016, 3:02 p.m.
July 11, 2016, 9:52 a.m.
June 20, 2016, 3:09 p.m.
June 7, 2016, 3:33 p.m.
May 26, 2016, 4:26 p.m.
May 5, 2016, 10:22 a.m.
April 28, 2016, 3:03 p.m.